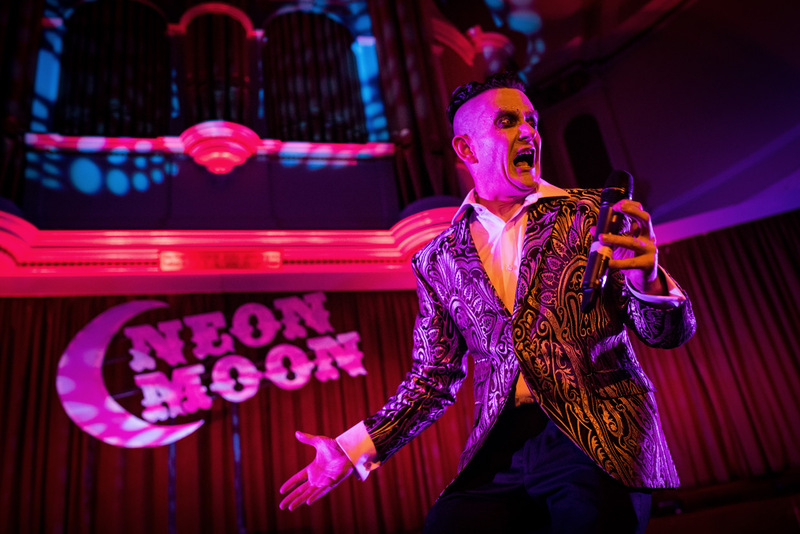 The Neon Moon Grand Halloween Ball took place this past Saturday. 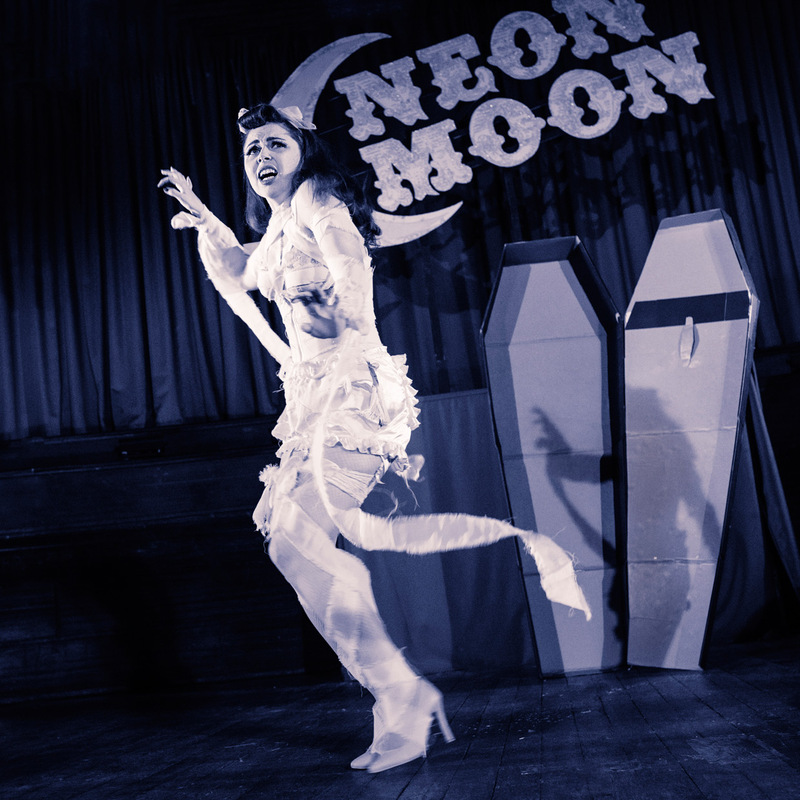 Those who have been reading my blog might remember the post from the previous Neon Moon Circus that I photographed. The director then as now was Ruby Truelove. This Ball was a super-sized version located in the Guild Hall in the middle of Cambridge. I have been passing by the Guild Hall for years, but never really known what was in the building. Just before leaving home I had checked the EXIF information of my old photos to see what lens I had used last time. I thought it was the 50 mm, but it turned out that it was the new 35 mm that had been on my camera then. So at the last moment I swapped the 50 mm lens for my 35 mm lens. In tight spaces, with large crowds of people, I figured it would be easier to get everyone in with a wider angle lens. On the other hand I would have to be close to the performers to get any good photos. When I arrived I saw that the hall was way bigger than I had expected. 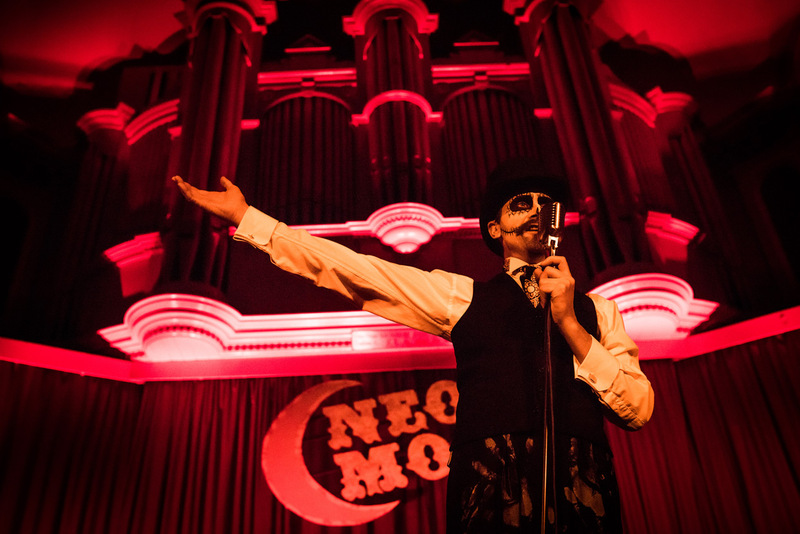 To have a chance to photograph the performers I asked if it was okay if I occupied the stairs in front of the stage. Luckily that was not a problem. A few times during the evening I had to move to make sure the performers and a few people from the audience could get passed, but most of the time it was not a problem. Also it meant I could sit down a few stairs down, so I would not obscure the audience. Paul Preston Mills, one of the two presenters of the show. Sitting so close to the stage meant I could make good use of the impressive background for this shot. Perhaps this photo would benefit a bit from being slightly lighter, however, I was trying to avoid saturating the red channel. Elizabeth Heale and Ashley Foster shared half a painted face each which I thought was pretty clever. Here shot close to one of the few lamps that I kept returning to like a mosquito with a camera, drawn to the light. 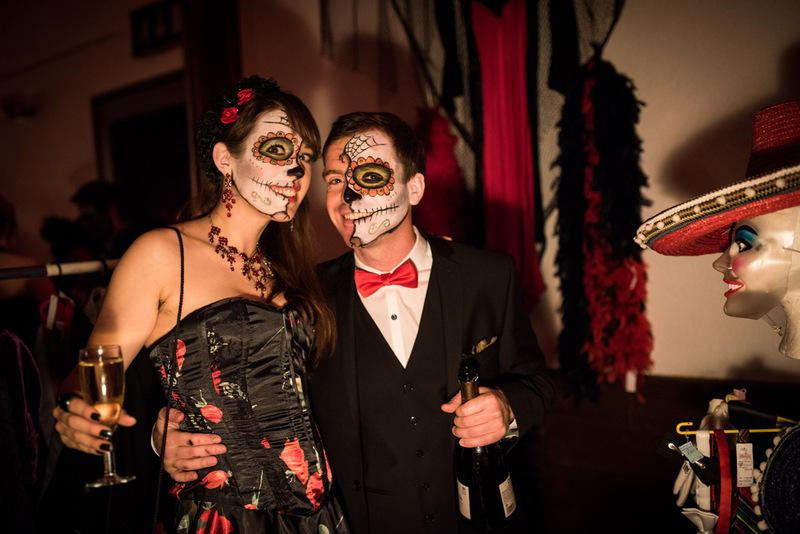 All the guests had really impressive costumes and face paint. Bruise Violet during her first act. For this shot I wanted to have the sign in the background to show where it was taken. She had warned that parts of her performance were quite quick with a lot of spinning around, so I went for 1/320 second to be able to freeze the action. At f/4 I was still able to keep a comfortable 800 ISO. Tabitha Ta Boo as a mummy, fresh out of the coffin, pealing off the bandage and discovering her new identity as undead. Notice the shadow on the coffin which was a happy accident. I have burned the shadows (darkened them) a bit to make them stand out more. The light was very red-pinkish so I desaturated the photo to try to bring out more detail. Alfie Carpenter, Kimberley Moore and Joanne Jordan backstage. I felt a bit creative so added a texture on top, you can see it around the edges. In retrospect the white balance is perhaps a tad too yellow. Getting the colours exactly right is tricky. Also I find that the ambient light in the room that I edit the photos affects how light or dark I make them. Photos edited at night tend to be darker. Need to figure out a way to correct for that. 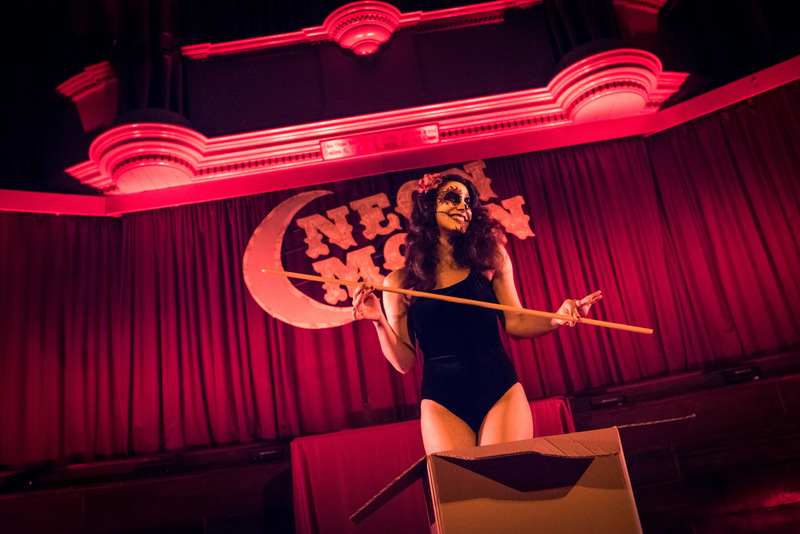 Natalya Umanska, one of the two hosts of the show, here climbing into a cardboard box. It is perhaps not the best shot, but it provides a context for the next photo and sometimes that is very important. If I had just showed the next photo you would not have known what was in the box (unless you were there). Someone is having too much fun. Looking through the photos now I think that 35 mm was probably a good choice, given that I was so close to the stage. If I shoot at this location again then I will perhaps try to mix up the angles a bit, to get more variations. I got some photos of the audience by turning around, but for example shooting from the side of the stage would have allowed having both the performers and the audience in the same photo (similarly to what I did at the circus). Desmond O’Connor ending the evening with a song. He started by standing on a dark stage with only a flashlight in his hand illuminating his face. 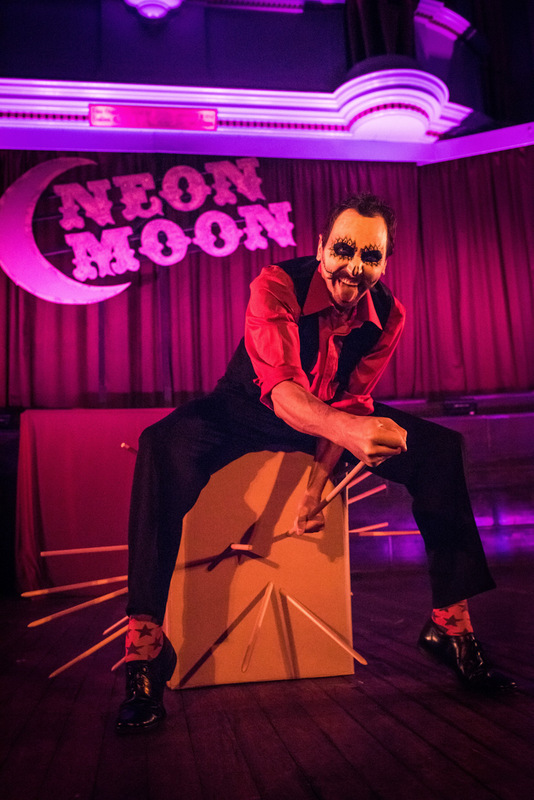 That made for quite a striking visual, however the pose in this photo nicely framed the Neon Moon sign, so I picked this one instead. I have said it before, and I will say it again. Photography is great, it takes me to do and see things I would otherwise not try. 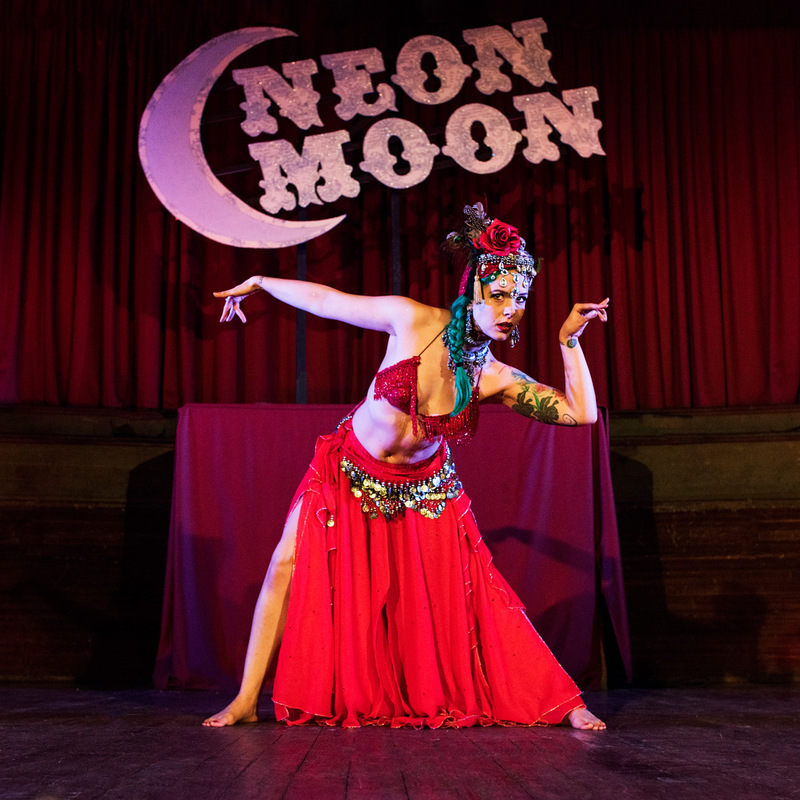 The Neon Moon shows are a visual treat, and provide a lot of opportunities for great photos. There are, however, some dangers when photographing a show like this: You have to watch out for glitter. Glitter gets everywhere, and I learned that scotch tape was quite effective at removing it from the camera. If you see someone taking out a bottle on stage, dive for cover! These performers like to share their drinks by spraying them all over. I guess I could say that my camera has been baptised now. Next time I do an event like this I will probably bring a second light source. Not for shooting the show, but for shooting the guests. There were a few scattered light sources, but not nearly enough. The best place to shoot was from behind the bar, where LED lights on the wall illuminated the guests ordering drinks. 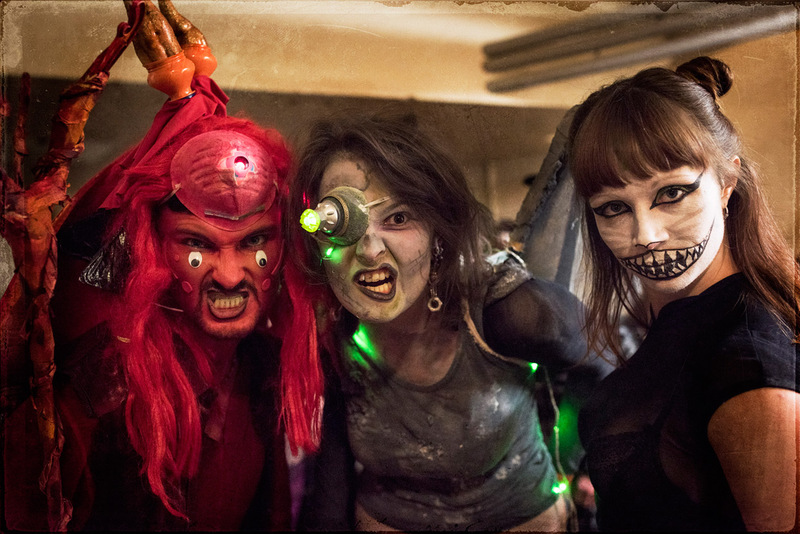 Special thanks to Priscilla and Nadia for helping me get some proper halloween make-up in the break between the shows!